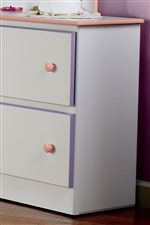 The Miami Collection features youth bedroom furniture in three different fun and lively finishes. A Black/White/Red combo, White/Pink/Lavender combo and Primary combo. These are the colors kids love that will bring energy and fun to any space. A captain's bed, desk, dresser, mirror night stand and chest are all featured in the Miami Collection. Create a the perfect space for your little one with this vibrant youth bedroom collection. Browse other items in the Miami collection from AHFA in the area. Simple and Clean Lines with Lavender and Pink Colors. Storage Space on Captain's Bed.